The cornerstone of the music culture at Parkside is our weekly Simple Gifts sing-along, and now, you can learn to play many of the songs we sing with Jam-Pa Joe! Joe is our founder and Head Music Maker, and over the years, he has written numerous songs with the children that are in regular rotation at our Simple Gifts celebrations. He is always looking for ways to help our families bring more music into their daily lives, and his latest efforts are ready for you to enjoy! In the videos below, Joe has taken some Parkside songs and broken them down so you can easily follow along and play them yourself. For each one, he first demonstrates the simple chords and then how to get a more complex sound with those same chords. Regular practice and keeping your guitar in tune (Joe recommends a Snark Tuner) are key to success, and before you know it, you’ll be ready to Jam with Joe! 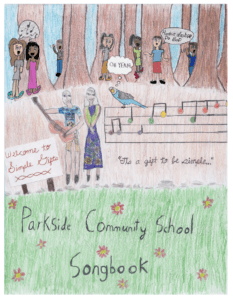 In 2016, Joe compiled many Parkside favorites in The Parkside Songbook, so now anyone can learn to sing and play along with the songs we sing at school each day. The songbook includes the lyrics and chords, and you can use it alongside the videos below. We hope to see you making beautiful music with us at Simple Gifts sometime!